Mason was forced to sit atop the toys while he waited to be rescued. 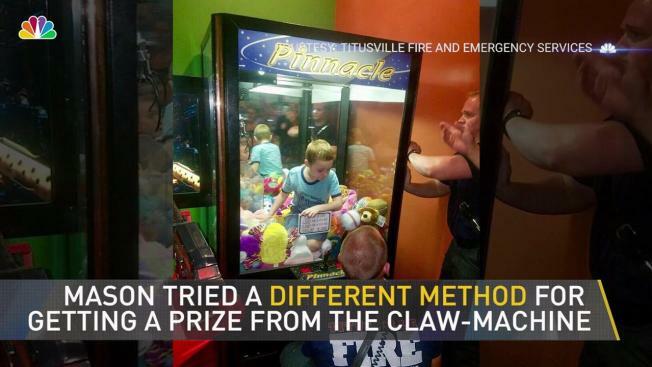 A young Florida boy wanted a stuffed toy, he crawled inside a claw-style vending machine in the play area of a restaurant. off-duty firefighter Jeremy House was also having dinner at the Beef O'Brady's restaurant in Titusville and yelled for someone to call 911. A young Florida boy wanted a stuffed toy from a claw-style vending machine, but he decided to get it his own way. Instead of playing the game the conventional way, he crawled inside the vending machine in the play area of a restaurant. And then he got stuck inside. Sutton says the boy was embarrassed, but wasn't in distress. The machine sustained minimal damage, and little Mason did get the stuffed toy he wanted, after all.